Transformational Journeys, of experiences in Nature. 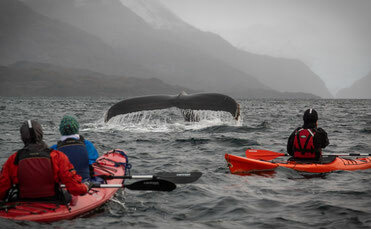 Sail next to the whales, between the fjords and the glaciers in the Strait of Magellan. A luxury adventure in the Francisco Coloane Marine Park. Nature, adventure, comfort and relaxation on a cruise of exploration. Your post in the most pristine and wild place on the planet. 18:00 Pick up main square of Punta Arenas. Transport to Carrera Bay. 19:30 Set Sail. Navigation towards Francisco Coloane Marine Park. 20:00 dinner and accommodation on board. 08:00 Show up time for passengers on deck in order to disembark on the zodiac boats on the beach. 08:30 Paddling start at Shag pass. A soft paddling around this area spending time searching for whales and wild life. 19:00 Sunset contemplation on the main deck of the ship. we combine the typical foods of the region such as austral fish, lamb, crabs, seafood, pasta with local sauces. - Transport from and to Punta Arenas. - Education about enviromental and historical facts. Considering the rough weather conditions of the zone, we recommend you to dress in layers. You should wear a base Layer made of merino wool or synthetic fabrics. Remember this is your next-to-skin layer. It helps regulate your body temperature by moving perspiration away from your skin. A middle layer (insulating layer) helps you retain heat by trapping air close to your body. Micro-fleeces, merino wool tops, soft shells and insulated jackets are some middle layers. And an outer layer that protects you from the wind and rain. You should also bring a warm beanie or a bandana, some warm gloves and comfortable shoes. 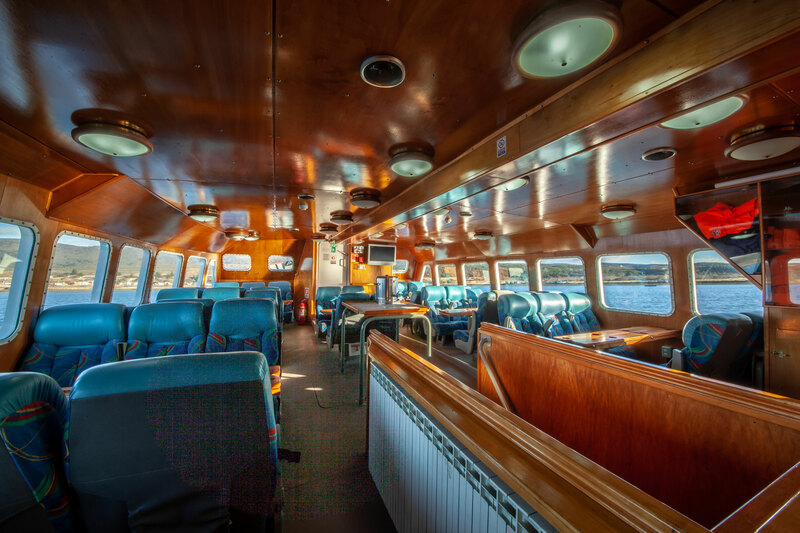 2 Double cabins, 4 quadruple cabins, dining room and one main deck. This ship has total capacity for 20 people. Located 50 km south of Punta Arenas, near from Bulnes Fort. It is known as an important port of shipment in the city of Punta Arenas. In May, 1843 the schooner “Ancud” set sail from Ancud, Chiloé Island, in command of Captain John Williams. After 4 long months of sailing, the schooner “Ancud” anchored outside “Hunger Port” on September 21st. Captain Williams took possession of the Strait of Magellan and its territory. In this place was founded a fort named “Bulnes”, in tribute to the current president “Manuel Bulnes”. San Isidro Lighthouse is the southern most habitable lighthouse of the American continent. It has more than 100 years of history that are part of the cultural heritage of the zone. 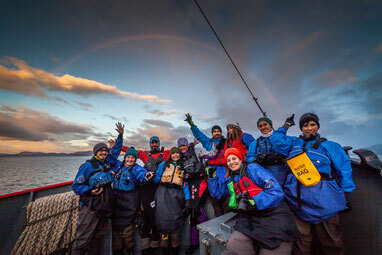 Pristine environment surrounded by sub-antarctic forests and marine wildlife such as the Peale's Dolphin, an endemic species of Southern South America. 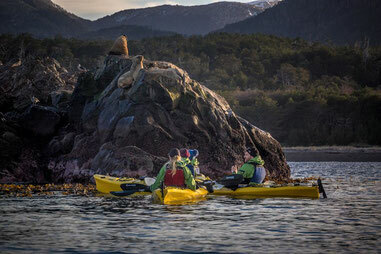 It is also possible to find Sea Lions and South American Fur Seals. Charles Darwin was one of the first explorers in the ascent “Mount Tarn” in 1834. He visited “The Strait of Magellan” and sailed aboard the famous English ship “The HMS Beagle" commanded by the Captain Fitz Roy during the 19th century. Darwin discovered the first ammonites that has been ever found in South America. Ammonites are ancient cephalopod molluscs with rolled outer shells and bilateral symmetry. Águila Bay is located 75 km south of Punta Arenas, at the beginning of the southeast coast of Brunswick peninsula. There was the first plant for storage and treatment of whale oil. There were important facilities for industrial slaughtering of cetaceans. In the active period of whaling they almost exterminated the species reaching a number of 30 cetaceans. Nowadays, there are approx. 240 whales remaining in the Magallanes Region. Located 90 km south of Punta Arenas. In this place is the famous “Cross of the seas” in tribute to all the brave sailors that have sailed this rough waters. Cape “Froward” was named by the English corsair Thomas Cavendish, in due to his many attempts to sail this waters. Froward means: difficult to deal with. Created in 2003. 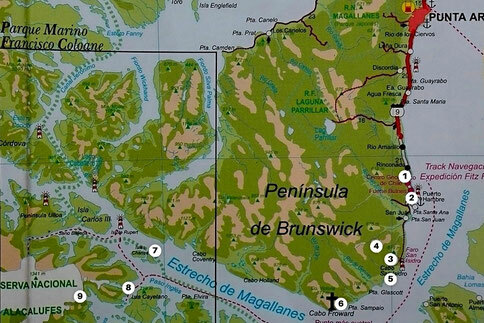 Located in Magallanes region, in the Strait of Magellan between Santa Ines and Riesco Islands. The Park was created because it is part of a very important biological corridor, being the habitat of the famous Humpback Whale and here is possible to see whales during their feeding season. The Shag Pass is located within the protected area of Francisco coloane Marine Park, between Cayetano and Santa Inés Islands. 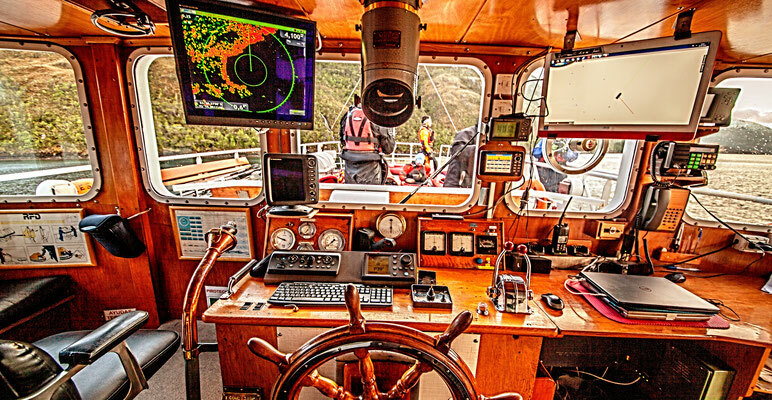 It is a place that has a great concentration of Humpback Whales and it is an essential point in our navigation. This is a tempered-cold glacier, it is sometimes very rainy and it use to suffer frosts. It belongs to the mountain range of the southern Patagonian Andes. The area is surrounded by dense sub-antarctic Nothofagus forests. There are also many islets and rocks covered with mosses and lichens, charactheristic of the sub-antarctic ecosystems. The marine ecosystem is determined by feeders and the convergence of migratory currents of many marine mammals and birds. The southernmost forests in the world grow in Magellanic Chile, where forest species extend their range to within about 500 miles of Antarctica. The Subantartic Magellanic Evergreen Rainforest Ecoregion runs along the western margin of southern South America, extending from Penas gulf (48°S) to Cape Hornos (56° S). The distribution of this Ecoregion is correlated with an oceanic microthermal temperature regime and high, constant precipitation. The vegetation shows principally two types of forest, mainly evergreen "Nothofagus betuloides" forests to the west and deciduous "Nothofagus pumilio" and "Nothofagus antarctica" forests towards the east. This forests are pretty old, some specimens of Nothofagus betuloides are probably 1500–2000 years. There are other species like "Pilgerodendron uviferum" and "Podocarpus nubigena" that may reach ages of ⩽1000 years. Even some of the small understory trees are probably several hundred years old. Its varied and majestic landscapes that include high mountain peaks, enormous icefields, and innumerable fjords are inhabited by endemic animal and plant species. Glaciers and icefields predominate toward the Andean mountains zone, while moorland and Tundra formation prevail toward the Pacific Ocean border. You can also find miniature forests covering the rocks and soil of the tundra formations along the coast and alpine zones with a diversity of lichen and moss species. This Tundra formations are characterized by prostate dwarf shrubs, cushion plants, grass-like plants and bryophytes on water-logged terrain that in different combinations form vegetation of scrub or bogs. The bogs comprise characteristic austral species such as Astelia, Bolax, Caltha, Donatia, Drapetes, Gaimardia, Phyllachne and Lepidothamnus.